The intricate designs for this frigate were developed by Mr. Sella di Genova in 1976/1977 and were taken from an old technical book typical of technical books from the 1940/1950 years, wide and low, published in German from the library of the "Ansaldo S. Giorgio" Shipyards of Genoa. In this book, write in German, in addition to plans of Ajax ship, there were also the technical plans of a steam locomotive and other technical drawings. His focus was on an illustrated set of drawings of the actual ship 'Aiax'. The plans illustrate in great detail the construction of a typical European frigate of the late 18th. called "Aiax"; also included are suggested modifications that would present a ship more typical of the early 19th. Century. The builder of this kit then has the choice of two different ships. The original technical book is no longer available and unfortunately no records of the text were kept by the previous owners of this company. 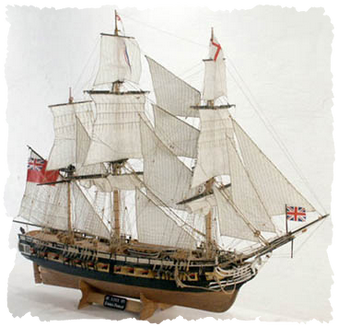 Thus the current Euromodel organisation presents this ship in good faith as a classic example of an eighteenth century European frigate. (For some reason, the astute builders will note the presence of English flags as it was drawn in this elusive technical book! That is a mystery in itself). Euromodel is anxious for support from enthusiastic modellers and those generally with a deep interest in naval history who might be able to track down this elusive German technical book describing the ‘Aiax’. In return, Euromodel would be more than happy to offer a free Euromodel ship kit of AIAX as token of their gratitude.